As Thailand’s largest island, Phuket is a true destination in itself, and unlike the majority of the islands in Southeast Asia even has its own international airport to support that. Its popularity has made it one of the most visited and best known islands in the entire region. Phuket is far more than just a beach destination, although if it is incredible beaches that you’re after then you’re in for a treat. Often described as the “Pearl of the Andaman Sea” thanks to its standing as the jewel in Thailand’s crown, it’s vast expanse also encompasses great mountains, dense jungle and marvellous wildlife. Please Note: This article is not intended to read as an unbiased review for any hotel or activity. It is a paid advertisement for Luxury Escapes. 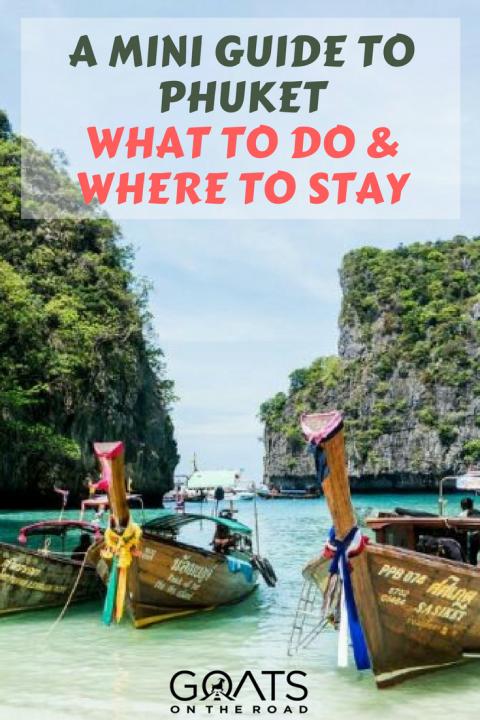 If you decide to use the links in this post, you’ll get a great deal on your stay, and you’ll help to keep this blog running. We appreciate your support! Let’s face it, the beaches are one of the main attractions in Phuket and what has kept drawing visitors back for decades. Much of the picturesque coastline is characterised by the extraordinary, green topped karst mountains that protrude dramatically from the turquoise waters. Whether you want a remote, secluded stretch of sand or somewhere with lots of life where you can sip a cocktail on a sun lounger, there’s a beach for you. Heading out on a boat cruise around Phuket and the surrounding islands is one of the best ways to experience this area. 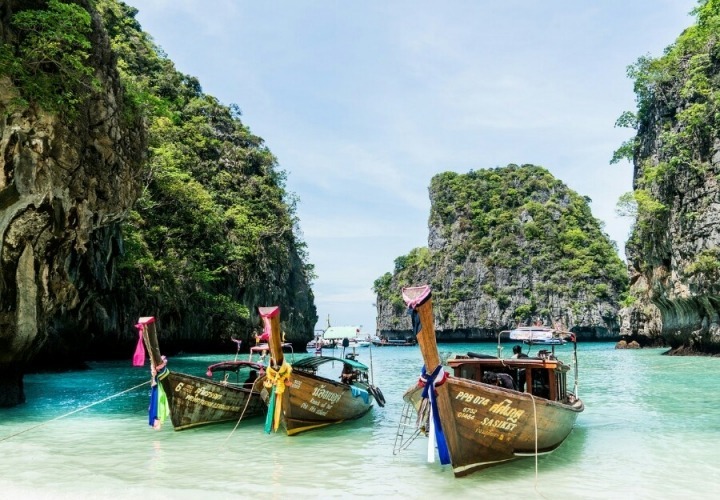 There are many to choose from whether you want a full day on the water, a sunset cruise or a visit to the nearby Phi Phi Islands made famous by the Leonardo DiCaprio film “The Beach”. Most tours will include food and drink and are a great opportunity to relax with the wind in your hair while seeing Phuket from a new perspective. The crystal clear waters around the island provide unbelievable visibility making it the ideal place to take part in some snorkelling or diving. You’ll see plenty of head turning marine life if you just head a short distance from many of the popular beaches. But if you’re a bit more adventurous, then book to go on a scuba dive where you’ll be surrounded by dozens of species of brightly coloured tropical fish. 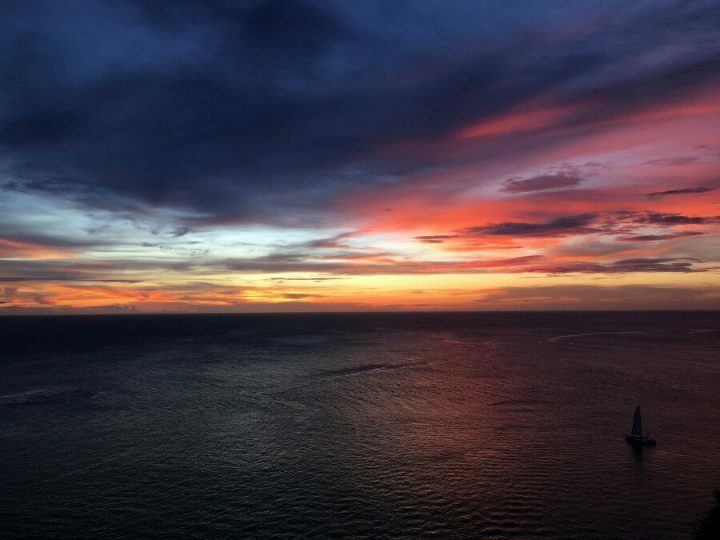 The sunsets in this part of the world are legendary and you won’t find many better than on the island of Phuket. It’s a great way to spend an evening, just grab yourself a cocktail or a cool beer, relax, sit back and enjoy the show. Deep golds, vibrant oranges and even bright pinks and rich purples bring an end to most days on this island paradise. 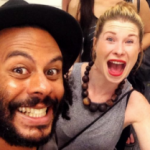 If you’re in the mood to let your hair down and party then Phuket is where it’s at. Most districts on the island have their own small bar scenes, but by far the most popular and exciting nightlife is found in Patong City. The bright lights of Bangla Road lead the way to the best bars, live music and DJs on the island. Wats, or Buddhist temples are found in abundance all over Thailand and Phuket alone has almost 30 spread across its interior. Wat Chalong is probably the most famous on the island and it’s certainly the largest, with its intricate details and remarkable architecture. 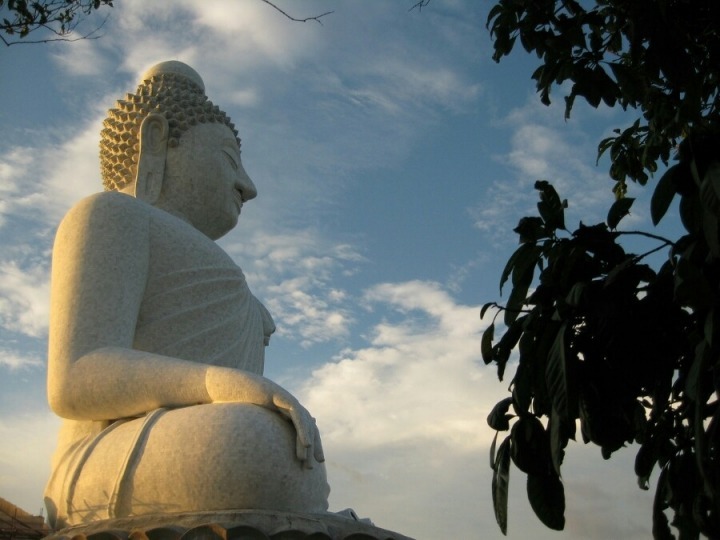 The 45 metre tall Big Buddha that sits on top of the Nakkerd Hills’ highest point is also great to visit, although it can be seen from quite a distance. The panoramic views across the south of the island are worth the journey alone. Thanks to the sublime beaches that line the West Coast of Phuket, this is by far the most popular part of the island and where you’ll find the most impressive resorts. 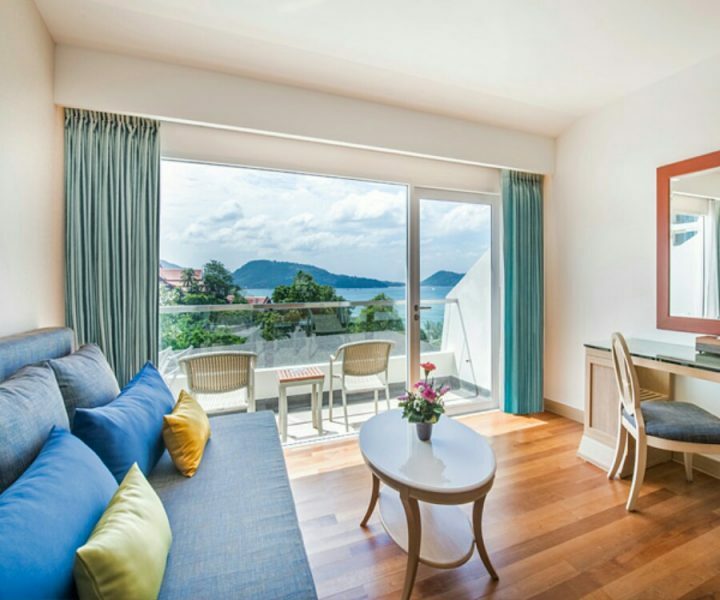 Diamond Cliff Resort & Spa is the perfect spot to base yourself in Phuket as it’s near to both Patong City and Patong Beach. 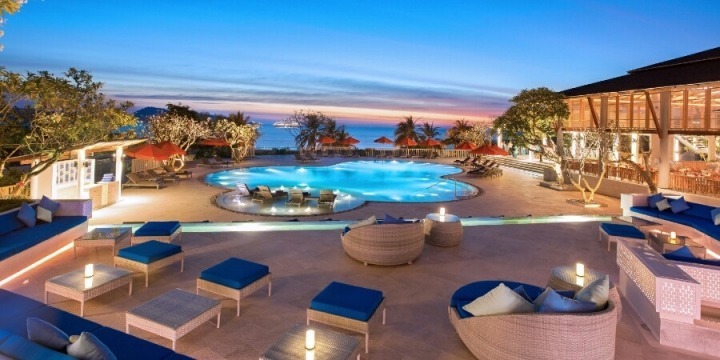 All of the suites are spacious and luxurious with tasteful decor and each room has sensational sea views from the hillside vantage point where this luxury hotel is situated. The facilities in the Diamond Cliff Resort & Spa are phenomenal and will allow you to enjoy a truly relaxing break in spectacular surroundings. Choose between the 6 restaurants and bars serving a range of cuisines from around the world, take a dip in one of the 2 swimming pools available or enjoy a pampering session in one of the 16 spa rooms. Select from dozens of options performed by trained professionals, ranging from traditional Thai massage to rejuvenating skin treatments. Phuket is generally warm at all times of the year and enjoys a tropical climate, but like the rest of Thailand experiences three distinct seasons. November to February is the coolest period and the most popular time for visitors thanks to it still being warm and mostly dry. March through May is the hot period and humidity begins to rise at this time as well. May to October ushers in the monsoon season when the weather is humid, but rains generally only fall heavily for a short period each day. With Phuket being such a large island, there are quite a few methods for getting around. Many hotels offer shuttle services to popular destinations near to the hotel for free of charge. Taxis and tuk-tuks are easy to find and convenient for travelling short journeys but can often work out costly for longer distances. There are plenty of local busses and songthaews that service the most popular parts of the island and are an inexpensive option. If you are wanting to explore further afield then it is worth considering hiring a car or a motorbike, just make sure you are covered by a good insurance. Whether you’re a sun worshipper, an adventure junkie or a party animal, allow yourself to be blown away by the variety that Phuket has to offer. As one of the most iconic destinations in Southeast Asia, it certainly lives up to its top billing. This has been a paid advertisement for Luxury Escapes.